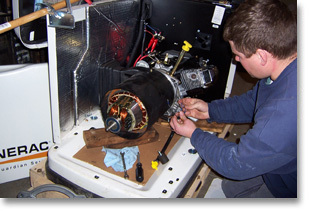 Like any investment, a stand-by home generator requires maintenance to be certain that it will be ready to serve its purpose when the time comes. Regularly scheduled maintenance on these home power solutions is very important, but regularly scheduled maintenance performed properly will give you the peace of mind that you sought in the original purchase of your generator. While this list seems extensive, every part is just as important as the next to insuring that the generator will run correctly in the event of an outage. A service technician should always provide you with a list of the work performed – not just an invoice. Use this list in the future to ask the company providing you with preventative maintenance what their visit includes, and make sure that the job they do is worth the price tag. Improper maintenance can lead to failures at the worst possible moments, so be an informed consumer and ensure that your generator will be ready to go when you need it most! 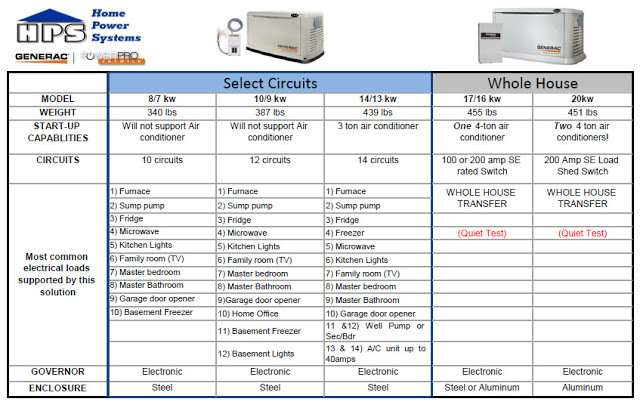 Selecting your Home Generator: What is right for me? Home stand-by generators have come a long way recently. They seem to have no limit to their capabilities and functionality. Whether it is a select circuit, whole house, or off the grid applications, stand-by generators are more capable and efficient than ever before. The newest lines of generators produce clean power that is safe for you, your family and your possessions. 1) What are you looking to power up within your home? Selected Circuits – This option is an excellent choice for the budget conscious consumer. Because you are choosing what your generator is actually powering in your house you can spend less money on the generator, and less on fuel. The only disadvantage is that your house’s power will be limited by the size of the generator and number of circuits you have connected to that generator . Whole House – This option is designed to provide power to everything in your house including any major electrical draws like an air conditioner. A whole house generator will run all your appliances, lights, computers, etc. If you decide to power your whole house there is less flexibility in choosing a generator because your generator will need to be a specific size to provide power to all the necessary circuits in the house. Your local generator professional can help you make sure you pick the right size generator to power all your circuits when there is a power outage. 2) Do you have any major electrical draws in your home? Certain items in a home can have a major impact on the amount of power you will need. Major electrical draws include electric appliances, (stove, well pumps, or air conditioning units.) You can use the sizing chart below to get an idea of the capabilities of certain generator models. Major electrical draws will require a more powerful unit to make sure that your family stays warm or cool, and safe when the power goes out. When considering your generator solution, cost may be a driving factor in your final selection. Selected circuit solutions are the least expensive as they are pre-wired and make for an easier installation, but there are limitations to what they will power. Whole house transfer solutions are more expensive, but everything works in the event of an outage. No disappointments. Remember, there are two types of generators, Select Circuit and Whole House. By asking yourself the 3 questions above you should be able to narrow down the options and make an informed and relatively easy decision.